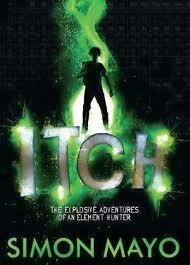 Meet Itch – an accidental, accident-prone hero. Science is his weapon. Elements are his gadgets. Itchingham Lofte – known as Itch – is fourteen, and loves science, especially chemistry. He’s also an element-hunter: he’s collecting all the elements in the periodic table. Which has some interesting and rather destructive results in his bedroom. Then, Itch makes a discovery. A new element, never seen before. At first no one believes him – but soon someone hears about the strange new rock and wants it for himself. And Itch and his family are catapulted into a breathless adventure with terrifyingly high stakes . . . The debut novel from BBC radio presenter Simon Mayo. Categories: Sci-Fi, Social/Family, Thriller | Tags: Simon Mayo | Permalink.